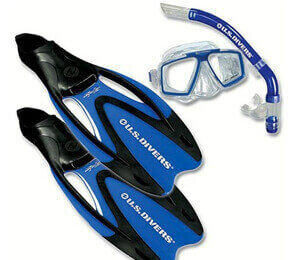 Since the whole point of snorkeling is to see clearly and comfortably under the water, your eye gear is perhaps your most important piece of equipment. Although some people use regular swimming goggles while snorkeling, most folks prefer the comfort of s watertight mask especially designed for scuba diving and snorkeling. Although there are many who argue the relative merits of one manufacturer over another, most snorkelers will agree that the single most important thing when choosing a mask is fit. Try on any mask before buying and be sure the mask skirt fits snugly around your face, as certain styles and manufacturers may better suit differently shaped faces. Tempered glass is much better for the lens, as it doesn't scratch as easily as plastic. The snorkel allows you to breathe as you swim face down in the water. Attached to the side of your face mask or goggles strap, it has a soft mouthpiece that seals out water. 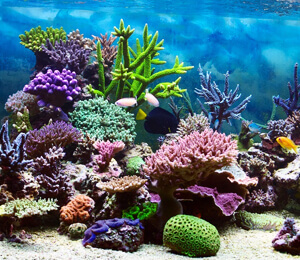 Some snorkels are solid, others have a flexible tube section, and some have a purge valve that has a sump area to collect any water that has come down the tube. 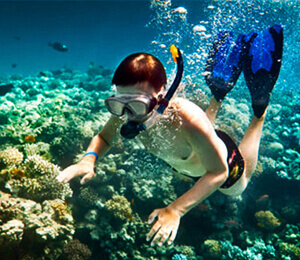 Choose a snorkel that is comfortable and has the right fit for your mouth size. Generally, it's easier to wear a snorkel with a mask rather than goggles, as attachment of a sturdy and heavy tube can cause the watertight seal around the goggles to break easily. Masks, on the other hand, are designed for use with a snorkel tube or breathing apparatus used in scuba diving. Of course, you'll want to be able to move with ease through the water, and the large surface of fins compared to your foot can give a lot more power to your swimming stroke. Full-fit fins have a rubber slipper in back that holds your heel, while open-heel fins cover your toes but just have a strap around your heel. Snorkel fins are smaller and lighter than scuba fins, as they only have to propel your body, and not your body plus a heavy air tank. Like masks, fins should be tried on for best fit and comfort, since feet, much like faces, come in all different shapes and sizes. Fins should fit well as far as length, width and arch height. If possible, try them on in the water with any fin socks or booties you plan to wear. You'll be aiming for a snug fit, as too-loose fins will fall off and too-tight ones will hinder circulations. Three-way straps that fit over your heel, ankle and instep are called fin straps and can be used with open-heel fins that are just a little too big, and booties can be worn to protect feet from coral and rocks.